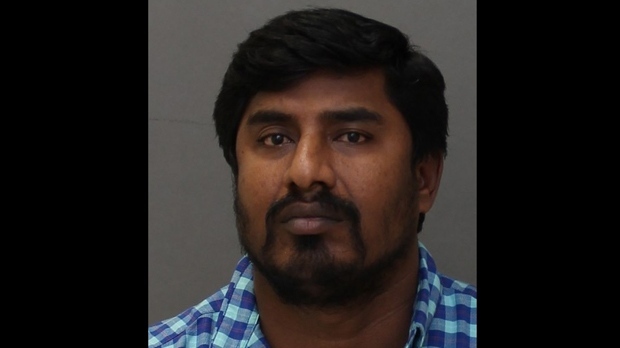 Murali Muthyalu, 37, is shown in a Toronto Police handout photo. A 37-year-old man from India has been charged with pretending to practicing witchcraft in Toronto. According to police, the man advertised his services as an astrologer and psychic between February and March of this year. A 44-year-old man told police he met with the suspect for his psychic services and was told that a sick family member had become the victim of an evil spirit. Const. Jonathan Morrice told CP24 that the victim brought his daughter, who is battling a mental illness, to the suspect to "heal" her. Morrice said the man continued to visit the suspect for healing sessions and was later billed $101,000 for the services. A suspect identified as Murali Muthyalu, a visitor from India, has been charged with pretending to practicing witchcraft, fraud over $5,000 and extortion. pretends from his skill in or knowledge of an occult or crafty science to discover where or in what manner anything that is supposed to have been stolen or lost may be found. It’s alleged the suspect also used the alias ‘Master Raghav’ to advertise his services. He made an appearance in a Toronto courtroom today. Anyone who had dealings with the suspect or has any information about the investigation is being asked to call police or Crime Stoppers.